The “New Orleans Writing Marathon” (NOWM) is a communal writing experience that takes writers out of the dis/comfort zones of their typical school and home writing environments and into new locations. Created in New Orleans twenty years ago, it involves groups of writers, over lengths of time varying from one hour to three days, writing their way across a landscape while voluntarily sharing their work with each other, socializing, and interacting with the outside world. A typical NOWM might find a community of thirty writers, after a brief welcome in a crowded room, splitting into groups of five with each group doing several rounds of writing and sharing as it moves independently from café to pub, park, river, restaurant, cathedral, and bookstore. pleasure—which comes from the act of writing itself, from being in the company of other writers, and from exploring new and old places as a writer. While the NOWM has taken many forms as it has spread across the country with the support of the National Writing Project, its success can be attributed to a few basic principles, a genuine respect for writers and their desire to write, and an emphasis on “writing in world.” The NOWM not only provides a model for studying the relationship between writing and place, but it also raises questions about how we currently teach writing and what we might do differently. It was February 19, 1994, my son Kevin’s third birthday, but instead of being home blowing out candles, I was at the Monteleone Hotel in New Orleans, along with about 100 other Louisiana Writing Project teachers, at an annual conference called the Festival of Writers. Keynote presenter Ralph Fletcher led a three-hour writing workshop in the morning, and National Writing Project founder Jim Gray spoke at lunch. The afternoon schedule offered a choice between ten Special Interest groups and my own 90 minute “writing marathon” scheduled in the Bonnet Carre room, overlooking the Mississippi River. 3 P.M. So it begins. What a great experiment. The clink of glass. The chirping of birds. The ringing of bells. I just now hear the voices. The music is what you hear first. What would you call it? A dirge? How many voices do I hear. The scratch-squeak of a waiter’s shoe. A creaking door sounds like it is talking in its own mechanical way to the birds who talk back. The music weaves us together. . . This is a first for me. . . How many sounds I have never heard before. . .
Those are the first words written at a NOWM. Little did anyone know 20 years ago what would follow: thousands of writers from elementary students to published novelists moving as writers across campuses, small towns, rural settings, and big cities, writing for enjoyment in the company of others. Because of its extended length of time, numerous short freewrites, voluntary sharing, and non-threatening response, Goldberg’s original concept of the writing marathon could generate surprisingly intense writing and build community quickly. As writers listened to each other read and then returned to their journals, a Zen-like calm came over the room. I noticed how writers riffed off each other’s writing, how they sometimes exposed their deepest selves in response to each other and the blank page, and how they seemed to become less and less aware of their place (a dull classroom) as they became more and more aware of each other. Clearly, Goldberg had designed a method of writing, and teaching writing, which succeeded by respecting the writer as well as the writing community. Location played a role in her marathon. Everyone surrounded a table. The room remained quiet except for scratching pens. For Goldberg, the physical location was essential—not as a source of inspiration, but as a safety zone where writers could achieve a Zen-like concentration. At our Summer Institute, in fact, we had put “Do Not Disturb” signs on our door when we began the marathon and whenever we did morning journaling together. In Goldberg’s marathon, while the place’s serenity helps transform writers by allowing access to their innermost thoughts, the writers in turn transform the place, essentially eliminating its dull existence for a brief time. I wanted to bring this traditional Goldberg experience to the Festival and initially intended to have participants sit around a table for writing intensely. However, before the workshop began, I had second thoughts. Knowing that these teachers from across the state rarely visited New Orleans, I realized that my workshop would be poorly attended or resented by participants who wanted to be on the streets of the French Quarter. What would happen if I just let participants spend an afternoon writing in the Quarter rather than sitting in a room? Wrestling with this question over lunch, I decided to combine what participants likely wanted to do (walk the streets of the Quarter) with who they really were (teacher-writers). At the end of lunch, I asked anyone wanting to join the writing marathon to change into their walking shoes and bring a jacket. The sign-up sheet grew from ten to thirty names. To kick off this first, experimental NOWM, I met with participants for about ten minutes to review Goldberg’s protocol and explain her “no response but a thank you” approach. This was something new for NWP teacher-writers, who usually thought of response groups as places for critique. I also said it was ok to enjoy oneself, to socialize, and to browse—that this was all part of the writing experience. This, too, was something new for conference participants. Who’d think of writing as enjoyment, or of mixing it with food, drink, and talk? Who’d think that writing could be used to interact with, enjoy, and know place? On the spot, directors who knew the French Quarter volunteered to lead groups (as we had no maps), and writers almost flew out the revolving doors of the hotel, journals in hand, to write along the Mississippi River, at a coffeehouse, and in one of the Quarter’s oldest bars, the Napoleon House. With only 90 minutes, each group had time to visit one place and do a few rounds of writing; however, the basics of the NOWM were formed, and it now differed significantly from Goldberg’s marathon. My pieces from the first NOWM represent two extremes of writing typically produced during a NOWM. A fragment focused on the external vs a letter focused on the internal, they are both saturated with place. Neither could have been written in a workshop, classroom, or home. Both only could have been written on a NOWM. What participants in the first NOWM discovered, beyond the joy of seeing the city as writers, was how writing and sharing “in the world” affected writing, sense of place, and self. Writing in a place could give the writer a sense of belonging to it or of ownership over it. Also, writing with a group and in a community contributed to one’s sense of place in the world. By 1996, the Southeastern Louisiana Writing Project (SLWP) was holding day-long NOWM’s during Summer Institutes, and by 2001 SLWP had hosted an overnight NOWM, with inexpensive hotel rooms reserved so that writers had more time to write and didn’t drive home after drinking. The hotel also provided a place to gather for read-arounds. By 2003, the NOWM grew to three days during Advanced Institutes, and NWP guests were invited to attend from across the country. In January 2006, our NOWM brought most writers to the city for the first time since Hurricane Katrina. Accompanying the twenty writers gathered in the Quarter were “virtual marathoners” from across the country who emailed to us throughout the day. Local participants with laptops emailed their own work back and read the virtual writing to their groups. This “virtual marathon” was the first of several to test or study the NOWM model. While the NOWM is based on writers writing whatever they want, wherever they want, with whomever they wish, SLWP experimented with several “themed” writing marathons designed to see what would happen if writers were invited to focus on a common subject or genre. The “In Search of Don Quixote” NOWM invited participants to quest throughout the Quarter for signs of Cervantes’ mad knight or broad themes. The results for one marathoner were his first novel, Don Quixote: Man of the Vieux Carre. More recent experimental marathons inviting writers to compose “Marathon Minutes” and “Marathon Letters” led to radio shows and publications. SLWP also held two Advanced Institutes to study the nature of NOWMs, which involved writers reflecting on marathon writings and experiences. To foster continuity for teacher-writers during the school year, SLWP sponsored bi-annual writing marathons in small towns, and to work more closely with youth, marathons became a major feature of its Young Writers Camps. Soon, a number of SLWP teachers reported using the NOWM in their classes, either writing across campus or taking students to New Orleans. Billie Smith won a Bob Costas Teaching Award that allowed her to bring ninety rural and displaced New Orleans writers to the city nine months after Katrina and to produce a book that received local media attention. While marathon writing, by definition, is meant to be extemporaneous, and while enjoyment rather than publication has always been NOWM’s hallmark, SLWP too began publishing its work in articles, anthologies, and radio shows co-produced with our college radio station. While the economy has prevented SLWP from funding overnight writing marathons lately, twenty writers paid for rooms to participate in the overnight 2013 NOWM. As the NOWM grew at home, it also began to appear at NWP Annual Meetings and Directors’ Retreats. At first, the NOWM grew by word of mouth rather than through official sanction. The first NOWM at an NWP Annual meeting (Baltimore, 2001) wasn’t on the program, but occurred after advocates passed out fliers at a social the night before. When NWP put the NOWM on the program and provided a space to start and finish, the event began attracting huge crowds (about 200 for a full day of writing in San Francisco in 2004). The NOWM also became a standard feature at Director’s Retreats after 2001 in order to foster writers and build community. Roughly a half of NWP Directors thereafter experienced the NOWM as writers. Directors then brought this practice back to their sites, and from there the practice filtered into Summer Institutes, continuity programs, and eventually into classrooms. NWP’s sponsorship of NOWMs clearly helped increase their popularity. The most obvious feature about a NOWM is that writing occurs in places outside of our most familiar writing locations—classroom and home. Place in a writing marathon is more complex than one first thinks, and therefore deserves analysis, especially if we are looking at how the NOWM might influence our teaching. A NOWM is based upon writers’ external, internal, communal, and invisible places. External Places: Whereas external stimuli can distract in Goldberg’s marathon, they a source of inspiration in the NOWM. External place in a NOWM consists of the entire world surrounding us—sky, street, pub, and writer’s group. External space in a marathon does more than stimulate and inspire, however. It often becomes the text and focus of one’s writing. The following examples from “New Orleans in Words” illustrate distinctly different everyday epiphanies about place. 7:30 A.M., Café du Monde. Kim Stafford. I’m just looking up at the painting on the wall—Jackson Square, the Cathedral, a black face surrounded by a halo of gold, and the inscription below: “It was just an ordinary day until I met Jesus at the Café du Monde”—when the Black waitress comes drifting toward me with a glass globe of coffee swinging in her hand. As Stafford notes in The Muses Among Us, Eloquent Listening and Other Pleasures of the Writer’s Craft, rather than attempt to be prophets, writers can be scribes to the world, listening to the muses around us as “professional eavesdroppers” who appreciate the abundance of the world (14). This past summer, we were on a marathon in the French Quarter. One person is our small group planned for us to go to a particular location. We were en route, chatting merrily through the blistering July sun and sweltering South Louisiana heat. Suddenly, a torrential downpour came out of nowhere, which is very typical if you are familiar with New Orleans. We sought shelter in a small pizza parlor. It was 10:30 in the morning and the place was not even open. The proprietors were gracious enough to let us take refuge there. Being a group of writers, we decide to do just that, write. I began writing a piece about my late father. For me, I feel that it is one of the better pieces that I have composed. The unique part is that it never would have occurred without the environment and the culture created by the writing marathon. I may have never created that piece if we were not caught in the rain. Before being introduced to my merry band of writers, I would have sat in the pizza place and talked with my friends until the rain passed. Fortunately, I now understand and dine regularly on the moveable feast that is the writing marathon. For Seamans, “the environment and culture created by the writing marathon” are connected, freeing writers from comfort zones that impede discovery’s delight. We all have expectations about our own writing. I came to New Orleans the day of that winter writing marathon expecting to write a piece about how time changes everything, how culture is swept along by time's current and is eventually lost. I would write a letter to the city itself, in the future, about how the good old days of faded print, bartender smiles, shrimpmen, dirty shoes, and live music in the streets were gone. Replaced by computer screens, smartphones, and smartcars. I had this expectation, to lament the inevitable loss of culture. And then I stepped into Molly's bar. I could barely grab a pen fast enough to write, “as I sit in this bar, warm glow from the yellow lights hanging from exposed rafters, framed newspaper clippings, cat in the jacket on the table next to us, fire hydrant inside set into the stone floor—I know the spirit will never die, that culture will last forever.” I felt a surge from that place (place I had never been before), that crushed my expectations. In looking over these entries and thinking about how I formed them, I've come to some conclusions: “external stimuli,” as you wrote, is dire. Pigeons, music, bar boasting, coffee, and bourbon would all fall into this category. When writing in the world, it's important to look around and listen. Another conclusion: drop all expectations. They can only hold you back. Save them for when you are in an office, your own home, a classroom, writing. When writing in the world, let the world tell you what you must write. External places can be unfamiliar or familiar, and each can produce surprisingly different effects on the writer. 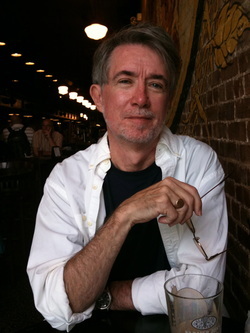 John Scanlan, from Oregon, did not know the French Quarter when he visited for his first NOWM. His piece from “New Orleans in Words” typifies those written in and about unfamiliar places. 1:45 P.M., Pirate’s Alley. The air is different here. Wet, heavy, sticky—I like it. I’m not sure I even knew I liked it before. I’ve hardly ever experienced it. I live in the high desert of Eastern Oregon where the air is bone dry and heat comes at you more like a sauna and less like a steam room. Maybe the novelty of this climate would soon wear off if every day I had to trudge through the heat and humidity and I would soon grow to resent it, but for now it feels like a big wet kiss from an exotic lover. Unlike Scanlan, Karen Maceira is a native of New Orleans, and had come to her NOWM reluctantly because of the city’s familiarity. Her piece illustrates a different kind of discovery. July 22, 2003. “Yesterday was Hemingway’s birthday.” This statement by George started the day off for me. The Quarter is so allied in my mind, my life, with my husband, my last love, and with Marcel, my first love. They both, as I, loved Hemingway. When I was in high school (the early 60’s), we all wanted to write like Hemingway, and I think Marcel wanted to be Hemingway. But is there anything here besides nostalgia? Nostalgia’s not enough—it can feel pleasant—pleasantly sad, wistful—but it’s not enough. Thinking about Marcel—the most striking thing about Marcel for me—that it was in his apartment here in the Quarter that I cut my wrists. I was 22, I think, just divorced from my first husband after a brief, disastrous 18-month marriage and visiting my old high school boyfriend. I don’t want to talk about this. . .
Below, Maceira’s reflection on this entry reveals how writing in and about a familiar place was difficult, yet cathartic. She also reveals how her writing group affected her willingness to write and share. The writing group, a significant part of a writer’s external space, can affect the writer as significantly as a jukebox or sticky bar. As Michelle Russo discusses below, her choice of place is usually purposeful because of the kind of writer she is. However, the choice of place is intimately connected to her writing group, who become part of her place, her experience of it, and her writing. The idea of place on writing marathon becomes more and more complex as I ponder it. For, in my experience during my marathons, I have found that a place is directly impacted by—directly connected to—the people I write with. Truthfully I think the variety of personalities in a writing group help to reflect the character of the place we decide to write. For this reason, I am a selfish writing-marathoner. While I welcome an outsider for a few rounds, I am rather exclusive with my marathon writing comrades. Because I want to write in places that are more relaxing, places that reflect the local, less popular locations without it seeming disingenuous, I want the people I write with to be similar to me in their desire for a quiet, breezy location with good chairs and the music turned down. I like a place that I can stay a while. And, I like people I don't mind staying a while with. One of Russo’s companions, Kate Lane, discusses how writing marathon groups increase her sense of self and ownership. I also think another major aspect of the marathon experience is community. I’ve written “alone” (which always implies isolation) and with a group and if I’m not gelling with a group I find it hard to break away and write on my own. Yet, I’m very aware of the difference in rhetoric here—on my own—which implies ownership and control versus the isolation implied by “alone.” I find that when I write with certain people, Carolyn and Michelle for instance, that the rhythms of my writing smooth out and I’m able to reveal dark/uncomfortable thoughts more easily—which probably speaks to my friendship with them more than anything—but it’s interesting to see how rhythms work and how imagery reappears through a group’s pieces over the course of a day. Internal Places: The external stimuli of a NOWM coalesce finally in the writer’s mind, a location unto itself that can be in sync with its surroundings or opposed. Passive recipient, active respondent or producer, the mind of the marathoner stands in a multiple relationships with the external. The passive/active opposition that marathons produce inside can result in Zen-like moments of quiet in loud places, in withdrawal, in epiphany, and in mad rushes of thought. The internal center of the writer’s self can be the place for observation, inquiry, memory, meditation, and imagination—all of which can be found in marathon writings. Tracy Ferrington discusses how the mind, if unable to interact with external stimuli, can inhibit marathon writers. When I was going through some terrible times—divorce, career crisis—my writing did not result in any satisfactory product. But I urged myself (in writing) to continue writing my way through the marathon, to keep going no matter how many false starts and dead ends I hit because I was loving being with other writers and listening to them read their stuff, even though I was not able to produce anything coherent. During one of these times, I turned to fiction writing because my own life story was a wreck at that moment, and I was able to take what the FQ offered and fictionalize it. I don't know if there are any conclusions to be drawn from that info. Maybe just that the marathon creates a writing space/time/place where writers can flourish or flail. It's lovely when we produce something we can use. But it's even better somehow when we don't produce anything useful on paper but we understand the value of being there, of accepting the opportunity, of honoring the time and space and place and other writers, when we accept the challenge of showing up and saying, "I'm a writer," before we know what, if anything, we will produce. On the other hand, when the mind is in sync with the street, epiphanies are possible, like novelist Bev Marshall’s below. Her piece represents many that begin with an external place (Bourbon Street), only for observation to lead to memory, meditation, and imagination. Marshall is transplanted like Hemingway, who in A Moveable Feast discusses how writing in a Parisian café “transplants” him back to youth in Michigan (5). 11:15 A.M., Bourbon Street. An octogenarian lady holds aloft a pink and white umbrella. It’s not raining, but we all know sun darkens Southern ladies’ skin. Here she comes now; 5’10” red stilettos, raven hair piled high on her head. “New Awlins ladies, them Creole babies.” She struts and the dark man with cornrows emits a low whistle. In recalling a particular NOWM experience at the Columns Hotel, Michelle Russo notes how her unfamiliar physical surroundings, which contrasted with her familiar writing group, influenced her ability to call upon distant memories. As she observes, the act of writing as well as sharing also connects the writer to place, and vice versa. The most memorable writing marathon experience for me was the marathon with three teacher consultants from the year I completed the Institute. I was with people with whom I felt comfortable. I was in places where we felt comfortable. And it made for a far more personal experience. We each got to pick our own kind of location; one where each of us wanted to spend some time writing. Carolyn's choice was at the Columns Hotel in the Garden District. Off to the right in the hotel is a little nook with a stained glass window and small pews. The place made me feel calm, it made me feel peaceful, and it provided a quiet opportunity to write. That round, I wrote about my sister marrying for the wrong reasons, marriage in general, the Catholic guilt associated with Church weddings and vows--all very personal, all of which I shared with my companions. Like most marathons, I felt like I could share anything with my group, but more specifically, the place called up memories about my own wedding, brought up ideas about tradition in my family, and my unsteady feelings regarding Catholicism. All this from a place that I had never been. I guess that's what I think the beauty of place comes from—because of the kind of writing I do—I appreciate the beauty of a memory that place brings back. That particular marathon really gave us each a piece of one another, both through the places that we chose and the writing that we shared in those places. Communal Places: While the opening location establishes the sense of community that inspires the day’s writing, the closing location celebrates the writing, writer, and community. The opening location: Every NOWM begins in a location where marathoners can meet, hear introductory remarks, and begin to form a writing community through a few rituals. Typical locations have included the gazebo in a park, the busy staircase of the Palmer House Hotel, a pub, a hotel meeting room, and my favorite—the Paul McCartney Suite in New Orleans Le Richelieu Hotel. The more comfortable and private the space, the better. After getting situated and receiving an introductory handout (see Appendix), map, and list of good writing spots, writers shake hands and say “I’m a writer” to each other. This ritual requires them to assert a new identity (as a writer) and to identify with other participants as well as with the marathon itself. The ritual of declaring oneself a writer is essential to the NOWM because it is both a kind of baptism of the individual designed to wash off the other roles in life and also an initiation into a community of like-minded people who offer to give up their other identities for the day in order to be writers together. The ritual of identifying oneself as a writer in this communal space is usually followed by everyone writing silently together for about 10 minutes before departing as writers. Beyond handling logistics, the opening place helps set the tone, start the writing, and create the marathon community’s magic. The closing location: In the best circumstances, a NOWM comes full circle by closing in the same location as the opening. The closing location also has a communal function: food is consumed, stories are exchanged, and the day is celebrated. Usually the day ends with a read-around, where writers are invited to read their work aloud, to talk about their experience of the day, and to receive applause. While writing marathons are about writing for oneself in the moment rather than for publication, NOWM writers enjoy bringing their writing to a public forum. It’s worth noting that when a writer reads a piece to the whole community, that writer’s group seems as invested in the piece as the writer is. Invisible Location: Can a location be invisible or metaphoric? NOWM writers sense an invisible presence uniting them, no matter how dispersed they are across a landscape, and that invisible presence is an integral part of the experience. The invisible marathon spirit could be likened to a river, flowing forward, filled with friends. While technically “insubstantial,” this invisible location has as profound an effect on writers as street, barstool, or writing group. It’s what compels those like Roman Keller to fetch a pen and write a poem even when alone on a balcony before the NOWM, or Tracy Ferrington to stop on her way home from a NOWM to continue writing. While Roman Keller writes that “the very essence of what the writing marathon is and what it does” concerns “spontaneous opportunity,” his reflection below suggests that those opportunities can be attributed to the NOWM being a kind of location that writers are inside. It was a marathon in New Orleans, staying on the second floor of the Richelieu. It was the morning of the second day and I made myself a cup of coffee, even though I am not really a coffee drinker, but it seemed like the thing to do. I stepped out onto the balcony with my cup of coffee to have a cigarette. I was looking down and watching the street cleaners scrubbing as much of the previous night away as they could and laying down that lemon scent. I looked up and across to whatever building it was across the street. I have no idea what the building was, what it once was supposed to be, or what it was being used for now, but it struck me all at once that that particular building could be nowhere else but in the French Quarter of New Orleans. If not for the fact that I was on a writing marathon, that I had been writing all the day before, that thought would have been all that came of that sight. I would have gone back into my room, finished my coffee and went about whatever my business might have been. However, I was on a marathon, so I rushed into my room, grabbed my journal and a pen, pulled a chair up to the doors to the balcony and began to write [a] poem. I can't help but think about the poet that wrote it. He only existed for about the 20 minutes or so that it took to write it. He hasn't been back since. But for one brief shining moment, in the dull sunrise on that balcony, someone else came into being. I didn't want it to happen. I didn't plan on it happening. If someone would have told me to write some poetry during the marathon, all that would have come out is crap. I don't claim it to be a great poem, or even a good one, but I love it. If I had to give it a name, I'd have to say the writing marathon is about spontaneous opportunity. The chance to truly be a writer. The writing marathon had not officially begun that day, but that poet decided he was gonna write a poem, and I am truly thankful that I was there at that particular morning, at that particular place, and at that time and place I wasn't a teacher, a brother, a son, a friend, a colleague, a boyfriend (though all those things play their part). I was a writer. In her essay “The Never Ending Marathon” found in an NWP Quarterly article on marathons, Tracy (Ferrington) Amond describes heading home in afternoon traffic and finding that she must pull off the road to eat and write hours after her NOWM ends. Unable to stop writing, she wonders “if I’m perhaps on some kind of adrenaline rush that needs to come down” (7). Like Keller, who entered the NOWM even before it began, Ferrington confirms what many marathoners sense: that there is something place-like about the NOWM itself and that being in “it” has an effect on writers like being in a shared location. Besides finding ways to hold NOWMs in our classes, how else can the NOWM’s thinking impact writers and teachers? Obviously, college teachers could pay more attention to the importance of place in writing; expand the kinds of places students write in and about; and be mindful of the components that contribute to a writer’s sense of place (external, internal, communal, and invisible). Also, we could determine ways to integrate the principles underlying the NOWM into our traditional classes. If we know that enjoyment, community, choice, and spontaneity motivate writers on a NOWM, how might we better infuse those elements into the learning environments we establish for our students? Also, helping students to identify themselves as “writers” rather than “students,” identifying ourselves as writers, and writing along with our classes could produce a sense of community that would change the nature of our classroom as place. Once that is done, stepping outside to write together is easy. Probably the most distinguishing characteristic of the NOWM is that it is about the writing act and the writer, not the writing product (though astonishing products often result). Most of our writing in school and in the publishing life is about product. We teach our students the so-called writing process: draft, revise, polish, edit, and when that is done, they have supposedly learned to write. What they have learned is one way to write. There is an entire world of writers—and enjoyment in writing—that this academically defined process does not tap into. But the NOWM does tap into it. We might call it “writing for the sake of writing.” Writing for the moment. Writing for the immediate audience. Writing as the foundation of other writing by peers who respond directly to our thoughts in their own writing. Writing as the experience of a moment or place. Writing for the self. Or as Robert P. Yagelski calls it, “Writing as a way of being.” None of that necessarily puts a paper in a portfolio to be graded, or a book on the bookshelf to be re-shelved years later in a used bookstore or shipped to Goodwill, or recycled to become cardboard boxes to contain books shipped to Goodwill. My point: the NOWM is all about the writer and the writing act, and enjoyment of the writing act, whatever it produces. In that sense, it is subversive, and nontraditional—probably one reason it keeps attracting writers. Perhaps all we need do to learn from the NOWM is to trust in our best instincts as writers and teachers; to question some traditional assumptions about writing, writers, process, and product, and place; and then to go out and write like we’ve never written before. Click here for a handout on the New Orleans Writing Marathon.